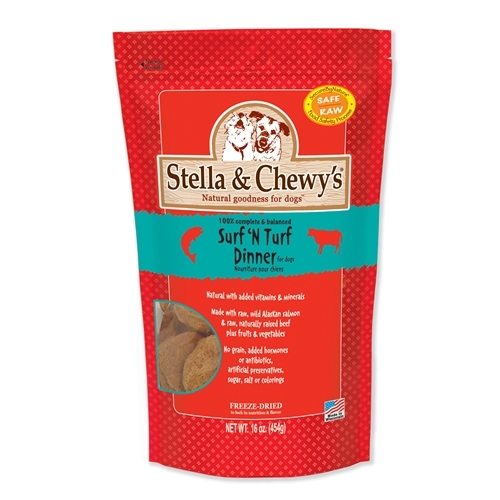 Stella & Chewy’s Freeze-Dried Surf and Turf Patties are made from RAW all-natural, human-grade, antibiotic and hormone free, wild Alaskan salmon, naturally raised beef, and freeze-dried to lock in the freshness of real meat. The patties are a complete diet and provide all the convenience of a conventional dry food without compromising the nutritional value, bio-availability, and proven health benefits of real raw meat. Serve as is or rehydrate by adding water. Great for travel, training rewards, and treats. Appropriate for all life stages feeding. If you are buying Stella & Chewy’s for the first time, please transition your pet slowly. Mix the new food with the old food product for 5-7 days (gradually increasing amount). Any food not eaten within 30 minutes of offering should be discarded. Wash your pet’s bowl with hot, soapy water after each feeding. Beef, Whole Ground Salmon, Beef Heart, Beef Liver, Turkey Beef Bone, Turkey Liver, Calcium Carbonate, Pumpkin Seed, Potassium Chloride, Organic Cranberries, Organic Spinach, Organic Broccoli, Organic Beets, Sodium Phosphate Monobasic, Organic Carrots, Organic Squash, Organic Apples, Organic Blueberries, Choline Chloride, Dried Pediococcus Acidilactici Fermentation Product, Dried Lactobacillus Acidophilus Fermentation Product, Dried Bifidobacterium Longum Fermentation Product, Dried Enterococcus Faecium Fermentation Product, Taurine, Tocopherols (Preservative), Zinc Proteinate, Zinc Sulfate, Iron Sulfate, Iron Proteinate, Vitamin E Supplement, Niacin, Copper Sulfate, Copper Proteinate, Manganese Sulfate, Sodium Selenite, Manganese Proteinate, Thiamine Monohydrate, Pyridoxine Hydrochloride, Vitamin D3 Supplement, Calcium Iodate, Vitamin B12 Supplement.